More great books for my kids! By the way, Mailbox Monday was created by Marcia of The Printed Page and hosted this month by Lady Q from Let Them Read Books. Twelve-year-old Lacey Little Bird loves spending time with Oma patake, an elder on her reserve who is like a grandmother to her. From her she is learning about the traditions of her people, the Siksika, including the art of beadwork. Lacey hears about a project to help grandmothers a world away in Africa who are raising their grandkids because the children's parents have died of AIDS. She decides to put her new skills to work and make beaded purses to raise money to help. 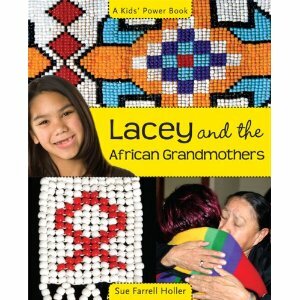 When a charitable organization brings two of the African grandmothers on a visit to her country, Lacey is thrilled to learn that they have asked to meet her. She is humbled when the African women tell her how her compassion and dedication have made a difference in their lives. Based on a true story. A true story of a courageous young man's wish to raise awareness of HIV/AIDS. So what did you receive in your mailbox last week? Have a great week, Merry Christmas and Happy New Years to you! Both books and authors new to me so thank you for the post. My mailbox is also up.Please do come over. Both are new to me too - hope you like them! I'm thrilled to find your Library of Clean Reads! How great! You have a fun site and great books in your mailbox this week. Thanks for sharing! Sounds like two really inspiring reads! Thanks for stopping by my Mailbox. Happy reading! Those both look like amazing books to share with your kids.